The restoration and development of irrigation requires the study of the efficiency of closed horizontal drainage in complex natural and economic conditions against the background of wide-reaching irrigation techniques. The purpose of the work is to establish the conditions of operation and efficiency of the systematic closed horizontal drainage on the irrigation arrays of SM "Frigate". The research was conducted on a research and production field, which is located on the Kakhovka irrigated array. The research methodology envisaged the collection and analysis of design and operational characteristics of irrigation and drainage systems, monitoring of data from many years of level of groundwater (LGW) and atmospheric precipitation, the results of periodic drainage surveys and drainage runoff measurements. The assessment of the effectiveness of drainage systems was carried out by comparing the actual and normative (critical) depths of the LGW. With prolonged exposure to LGW above critical depths, the work of drainage was considered insufficient. Prolonged irrigation on the array led to regional and local elevations of the LGW. The regional rise in the background of irrigation occurred at an annual rate of climb of about 0.8 m / year. Local manifestations of flooding and underflooding of land were observed at the bottom of the decline, in the near-channel zones and in the sprinklers machine "Frigate". It was established that at the initial stage of operation of the drainage system closed closures with the greatest depth of lying were included in the work. The consumption of water on collectors reached 2.0-3.8 l / s. Field drains mostly did not have runoff. Closed horizontal drainage under irrigation SM "Frigate" provided high efficiency, reliable water drainage, stabilization of LGW growth and favorable hydrogeological and reclamation situation. According to the results of research, a complex of engineering, technical and technological measures that reduce the water load on drains has been developed. Further development of research should be conducted in the direction of rational use of existing drainage systems, extension of their operation, maintenance and improvement. 1. Babitska, O.A. (2011). Efektivnist’ sistem inzhinernogo zahistu vid pidtoplenia samoplyvnogo typu ta prymusovogo typu ta napriamy iih udoskonalenia. [Efficiency of systems of engineering protection against flooding of self-propelled and forced type and directions of their improvement]. Extended abstract of candidate’s thesis. Kyiv. [in Ukrainian]. 2. Baksheev, E.A., Matiakh, N.M., & Karuk, B.P. (1976). Kakhovskaia orositel’naia sistema. [Kakhovskaya irrigarion system]. Gidrotekhnika i melioraciia, 5, 103-113. [in Ukrainian]. 3. Bobchenko, V.I. (1979). Razvitie meropriiatiy po bor’be s zasoleniem oroshaemykh zemel’. [Development of measures to control salinization of irrigated land]. Sb. nauch. trudov VNIIGiM: Sovremenye problem melioracii zemel’. Moskva, 161-173. [in Russian]. 4. Bulaevskaia, I.D., & Drachinskaia, E.S. (2006). Aspektu analiza dolgosrochnoy dimaniky yrovnia gryntovuh vod v Khersonskoy oblasti. 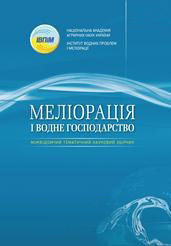 [Aspects of analysis of long-term dynamics of groundwater level in the Kherson region]. Ekologiia i resyrsu: Zb. nayk. prac' Instyty problem nacional’noii bezpecy RNBOU, 14, 68-72. [in Ukrainian]. 5. Vasilenko, I.L., Kal’nenko, I.F., & Strokovskiy, V.S. (1987). Formirovanie yrovennogo rezhima gruntovukh vod na Kakhovskoy orositel’noy sisteme. [Formation of the level regime of groundwater in the Kakhovskaya irrigation system]. Melioraciia i vodnoe hoziaistvo, Kyiv: Urozhay, 67, 15-17. [in Russian]. 6. Emel’ianov, V.A., Babenko, U.A., Matiakh, N.M., & Shevchenko, U.A. (1992). Vodnuy rezhum gryntovukh vod pri oroshenii DM «Fregat». [Water regime of soil-grounds with irrigation of the SM «Fregat»]. Gidrotekhnika i melioraciia, 1, 46-51. [in Russsian]. 7. Bygai, N.G., Vinogradov, S.G., & Vnychkov, V.V.(1987). Drenazhnue sistemu v zone orosheniia. [Drainage systems in the irrigation zone]. Kyiv: Urozhay. [in Russsian]. 8. Zhernov, I.E., Muramcev, N.N., & Romashchenko, M.I. (1978). Opredelenie infil’tracionnogo pitaniia po raschetam vlagoperenosa v zone aeracii. [Determination of infiltration nutrition according to moisture transfer calculations in the aeration zone]. Melioraciia i vodnoe hoziaistvo, Kyiv: Urozhay, 44, 74-81. [in Russsian]. 9. Zhovtonog, O.I. (1986). Obosnovanie metodiki planirovaniia polivov s ychetom neodnorodnosti pochvu na polyah. [Justification of the irrigation planning method taking into account the heterogeneity of soil moistening in the fields]. Candidate’s thesis. Kyiv. [in Russsian]. 10. Dypliak, V.D., Savchyk, D.P., Lesnichiy, V.N., Kezemka, I.P., Matiakh, N.M., & Shevchenko U.A. (1992). Kakhovskiy orashaemuy masiv: drenazh i okhrana prirodu. [Kakhovsky irrigated area: drainage and nature conservation]. Melioraciia i vodnoe hoziaistvo, Kyiv: Urozhay, 9-12, 31-35. [in Russsian]. 11. Oleunik, A.Ia. (1986). Metodicheskie rekomendacii po raschetam zashchitu territorii ot podtopleniia v zone orosheniia. [Methodical recommendations on calculations of protection of territories from flooding in the irrigation zone]. Kyiv: Minvodhoz USSR, Instityt Gidromehaniki AN USSR. Ukrgiprovodkhoz. [in Russsian]. 12. Nasedkin, I.U., Chernodolia, G.A., & Zhivotov, A.D. (1983). Formirovanie gidrogeologo-meliorativnoy obstanovki v zone Kakhovs’koy orositel’noy sistemu. [Formation of hydrogeological and reclamation situation in the zone of the Kakhovskaya irrigation system]. Melioraciia i vodnoe hoziaistvo, Kyiv: Urozhay, 57, 27-29. [in Russsian]. 13. Morozov ,O.V., Bidnuna, I.O., Morozov, V.V., & Naydenov, V.G. (2014). Otsinka sychasnogo gidrogeologo-meliorativnogo stany zemel’ Kakhovs’kogo zroshyvanogo masivy. [Estimation of modern hydrogeological and reclamation state of the Kakhovskaya irrigated land]. Visnuk agrarnoii nayku Pruchornomor’ia, 2, 103-111. [in Ukrainian]. 14. Romashchenko, M.I. (1992). Nekotorue aspekru obosnovaniia ymen’sheniia orositel’nukh norm. [Some aspects of the justification for reducing irrigation norm]. Vestnik YAAN, 3, 33-39. [in Russsian]. 15. Romashchenko, M.I., Drachinskaia, E.S., & Shevchenko, A.M. (2005). Informaciyne zabezpechennia zroshyvanogo zemlerobstva. Konceptsiia, stryktyra, metodologiia organizatsiii. [Information provision for irrigated agriculture. Concept, structure, methodology of organization]. Kyiv: Agrarna nayka. [in Ukrainian]. 16. Romashchenko, M.I., Grin’, U.I., Konakov, B.I., & Babitskiy, V.V. (2012). Potreba y doshchyval’niy tehnitsi dlia vidnovlennia zroshenia v Ukraine. [Neces sity in sprinklers for restoration of irrigation in Ukraine]. Vistnuk agrarnoii nayku, 9, 44-48. [in Ukrainian]. 17. Romashchenko, M.I., & Savchyk, D.P. (1998). Pidtoplennia Pivdnia Ukrainu: prichinu ta zapobizhni zakhodu. [Flooding of the South of Ukraine: Causes and Precautionary measures]. Vodne gospodarstvo Ukrainu, 5-6, 6-12. [in Ukrainian]. 18. Khimich, D.P., & Tsvetova, E.V. (1979). Balans gryntovukh vod i otsenka ikh infil’trathionnogo pitaniia v ysloviiakh tiazholukh pochvo-gryntov Kerchenskogo polyostrova pri polivakh dozhdeval’numi mashinami «Fregat». [Balance of groundwater and estimation of their infiltration nutrition in the conditions of heavy soils of the Kerch Peninsula under irrigation with sprinkler machines "Fregat"]. Melioraciia i vodnoe hoziaistvo, Kyiv: Urozhay, 47, 35-39. [in Russian].